The easiest way you can make a Mongolian beef recipe! The beef gets meltingly tender in the slow cooker and the sauce becomes incredibly silky, with great spicy/sweet flavors! 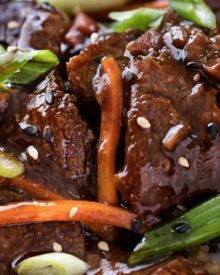 All of the amazing spicy/sweet flavors of Mongolian beef, but in an incredibly easy slow cooker meal with just 10 minutes of prep. This is the Mongolian beef recipe for the busiest of people! Who here loves Chinese take-out style meals? *raises hand frantically* I love all the bold flavors, great sauces, and how quickly things cook! One thing I don’t like though, is how hectic it can be to cook take-out style meals at home. The nature of a stir fry is that things cook really quickly, which means you have to have every component in the recipe ready to go… and things can STILL get stressful right? 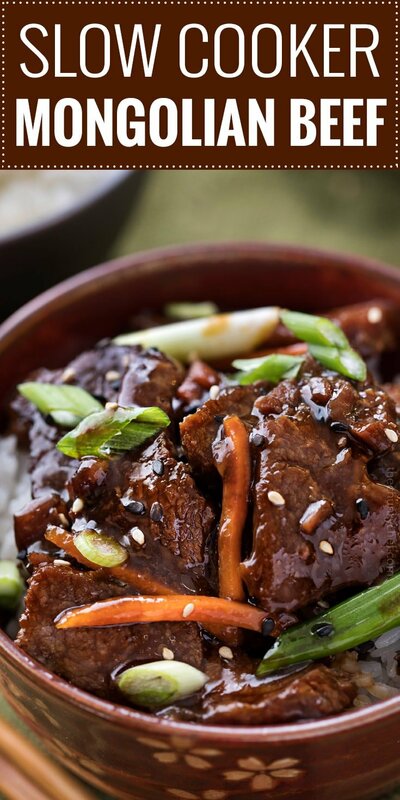 The main thing I love so much about this Mongolian beef recipe is that unlike some slow cooker meals, it’s made entirely in the slow cooker, with no extra steps to take. No browning the meat, no broiling… just adding all the ingredients, turning on the slow cooker and walking away. Simply amazing. And this meal is certainly not short on flavor! 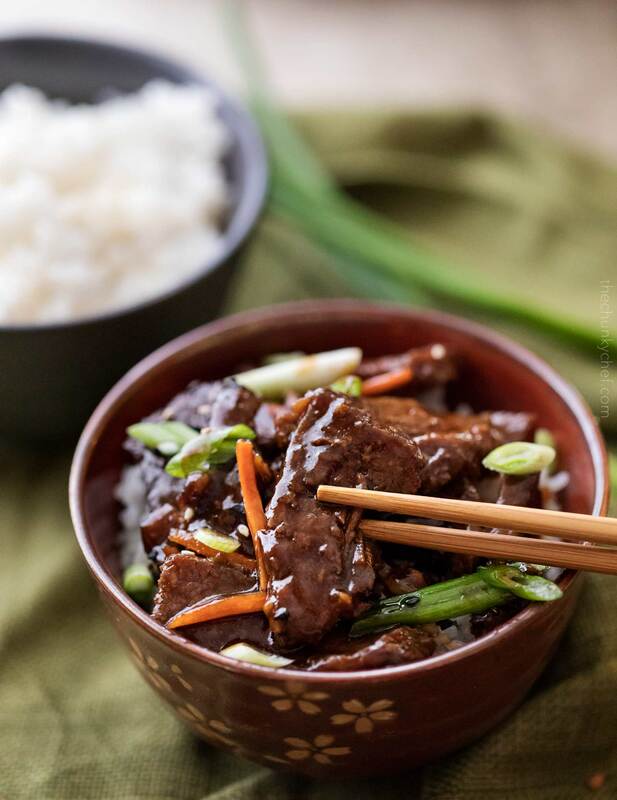 The garlic and ginger bring plenty of classic Mongolian beef flavor, and combined with sweet/heat combination of brown sugar and Sriracha sauce… it’s a powerhouse of amazing flavors! 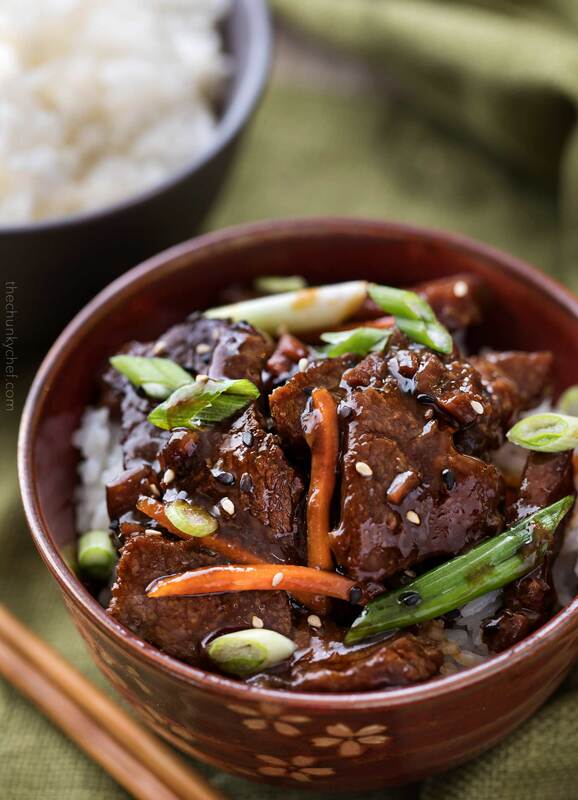 Typically Mongolian beef is made with soy sauce, brown sugar, ginger, and garlic. I like mine to be a little sweet and spicy, so I add some Sriracha to it as well. WHAT KIND OF BEEF DO YOU USE IN MONGOLIAN BEEF? Most recipes, including both this slow cooker version and my classic recipe, use flank steak. I’ve also heard of people using sirloin steak as well. Slice your flank steak against the grain. As you’re looking at the beef, you’ll see lines, like the grain on a piece of wood. You want to slice it across those lines, not alongside them. Doing this ensures an incredibly tender piece of beef. The carrots are optional, but add a great texture! Add the Sriracha to your tastes. I like this recipe to have a little heat to balance out the sweetness. To make this a complete meal, add some steamed broccoli and rice! My original classic Mongolian beef recipe has done so well, with so many of you emailing with rave reviews, so I knew I didn’t want to deviate from those flavors. To adapt the sauce to work well in a slow cooker I added some extra soy sauce and water. Also, since there’s no marinating with this recipe, I added some extra ginger and Sriracha to boost the flavors. 4 quart slow cooker – My absolute favorite slow cooker! Add sliced flank steak and cornstarch to a large resealable plastic bag. Close and shake to coat well. This can be done in a large mixing bowl as well, but I find it's less messy to do in a bag. Excellent recipe. I ran short of 1/4 cup of soy sauce so I substituted with 1/4 cup of Heinz 57 Sauce to complete. It came out fantastic. The kids all went for a second serving. 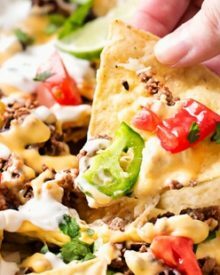 Super easy to make and incredibly tasty!!! I have made this 3 times, once for my in laws. They loved it. The only thing extra I had to do was add a little beef broth towards the end because it cooked down too much. 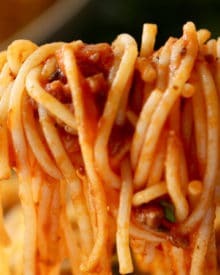 One of my favorite dishes! If I am going to put it in the slow cooker early in the morning and leave it all day, would it be better to not preslice it? I haven’t tested it that way, but I think if you’re going to cook it longer than the 4 hours on low, I’d leave the meat whole. It probably won’t slice after cooking though, it’ll be easier to shred it. I cooked it for my family today and my husband loved it. It was very delicious the only thing I would do the next time is using more beef it was not enough. I was thinking to add more meat and cook again with the sauce I’m not sure if that would work. Just the most tasty slow cooker meal ever! Have made this loads when friends are coming over & its been a hit with everyone. 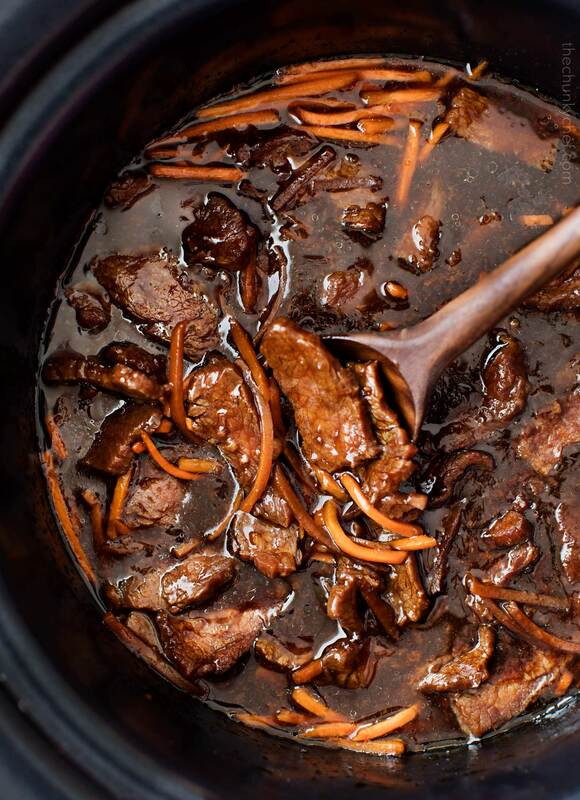 You do literally just throw all the ingredients in & let the slow cooker do its magic. This sounds delicious. Can I halve the recipe? This is delicious. A big hit with the WHOLE family. Second time making it tonight, first time put it over saffron rice, gonna try it over buttery cauliflower rice tonight. I also add extra carrots and add snow peas. But the recipe is just fine as is. Highly recommended. I haven’t tested the recipe, except as written, so I can’t say for certain, but I would have the ingredients prepped. Hi! I only have beef for stew on hand; would that work? I’m not sure, as it may need longer to cook to become tender. I used stewing beef, sliced. It was wonderful. Absolutely wonderful. Everyone loved it. Easy to make. I made it the first time for a dinner with friends, absolutely delicious. Everyone had seconds, because it is so sweet/spicy in perfect proportions. Tomorrow, doubling the recipe for big family potluck and with basmati rice and a green side dish, i know it will be a hit. If I let it cook for 4 hours on low, can i leave it on keep warm setting overnight? I think it might dry out if left on warm that long. This recipe is fabulous! I normally hate using the slow cooker because everything comes out so bland but you nailed it with this one! 4 hours on low is perfect and the meat was so good! I’m putting this into my regular recipe rotation for busy nights! Can I use a chuck roast? I think the meat would be a little tough, since chuck roast normally takes longer to cook. My husband and 4 kids loved this tonight! Do you have any idea how hard it is to find a recipe that my entire family enjoys?! It was magical… thank you so much for a whine free evening. 😀 This will absolutely be in my rotation from now on. Thx for sharing this – so easy 😀😀 I got tired of waiting around 1 hour into slow cook. Thank goodness for instant pot!! Switched over to pressure cook setting high for 30 min and it came out perfectly. Prob would lessen sugar next time and add more heat. Also not sure if the cornstarch is necessary for the instant pot version so will try without it next time. I added leeks and red pepper slices and reduced sugar to 1/2 cup!!! Used simple stir fry steak already sliced!!! This will be made over and over!!! Yeah!!! Thanks! Thanks Amanda, I used a lower grade of supermarket “chopped steak”, substituted cut green beans instead of carrots, and used dried red pepper flakes as you suggested. Otherwise the same preparation process and other ingredients. Green beans were added at the 3-hour point on your Slow Cooker (low heat) 4-hour cook time. Served with steamed Broccoli over properly prepared (twice rinsed Nishiki brand) white rice. Excellent rendition! Loved it. Made for large family so doubled it up. Came out great just doubling everything. I did add one thinly sliced onion and some broccoli as well in the end for about an hour. Probably reduce sugar a bit next time for me, but everyone else loved the sweetness level. Hi! Can this be put together the day before ? Hi Marlene 🙂 I wouldn’t recommend putting the whole thing together, since the cornstarch will start “working” as soon as it’s combined. But you could absolutely slice the beef and make the sauce ahead of time and just keep them separately refrigerated. It would cut down on prep time considerably! Can this be slow cooked in the oven as my slow cooker is not working? Very cool that you added tips and tricks to the recipe instructions! Very helpful to low skill cooks like me! OMG SOOOOOOOO good thank you for sharing. Is there any reason not to just mix the cornstarch with the sauce ingredients, rather than coating the meat with it, since it all gets stirred together? Hi Ruth 🙂 I’ve tried it both ways, and I like the texture of the meat better when it’s been coated. It allows the sauce to “cling” to the meat a little better. Followed receipe…too sweet! Next time I will cut the sugar😁 I will try it again but will tweek the receipe. Is this suppose to be sweet? Hi Mary, yes the Americanized version of Mongolian beef is sweet. Hi Hege 🙂 I’ve never doubled or tripled the recipe, but I would assume the cooking time would be about the same, maybe a little bit longer. And yes, reheated leftovers taste great! Thanks for specifics on how to slice the beef, its’ like youre right there in my kitchen! Delicious and so easy to prepare! Have you tried to add frozen broccoli or tried this with chicken? I haven’t, but I think either would be great!! How many calories are in this recipe? And or calories per cup? Hi there 🙂 I don’t provide full nutritional information for my recipes, as I’m not a nutritionist and don’t want to inadvertently pass out incorrect information. My advice would be to plus the ingredients into whichever online nutrition calculator tool you typically use. myfitnesspal.com is a popular one. Can you use skirt steak instead of flank steak? Can you use dark brown sugar instead of light? Yes 🙂 You might want to use a little less though, as dark brown sugar has a higher molasses content, which can be a bit strong for some people. Made this for the family tonight and it was voted a KEEPER! I served it in a large pasta bowl – layer of rice, layer of steamed broccoli and the Mongolian Beef. OMG! We will be making this again soon. We had this tonight and it was delicious! We added some steamed broccoli in about 10 minutes before we ate it. Perfect amount of spicy and sweet and so easy to make! This looks really good! Looks like a new family favorite! I’m totally trying this. Thanks for another amazing recipe!! I love a slow cooker beef recipe that doesn’t have to be seared before hand! This looks amazing – I know my boys will love it! 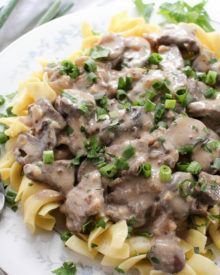 This slow cooker dish is the best! I have got to make it soon! I love this! looks so good! Must make it! This is making me hungry! Looks perfect for dinner any night! Slow cooker recipes that literally require nothing else than putting things in a slow cooker are my favorite! Saving this one! mmm…I am loving this! Such an amazing dish! !